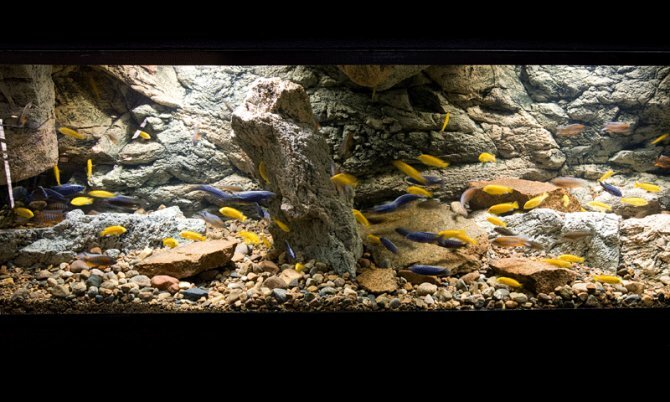 Get your creative juices flowing with this lovely African cichlid set-up. This stunning set-up contains a moulded Back to Nature background. These are not cheap, but add instant impact and can look really impressive, even if you have no aquascaping flair. This one has been used to recreate a part of Lake Malawi, but you could add whatever fish you liked. We wouldn’t recommend this particular combination of fish! Go for either mbuna, such as the Yellow labs pictured, or the blue Sciaenochromis fryeri — but not together.